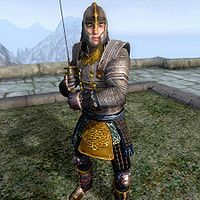 Fortis is an Imperial Blade who resides at Cloud Ruler Temple in the Jerall Mountains north of Bruma. He spars with his partner, Pelagius, although no other details about their friendship is revealed. After waking up early at 5am, he and Pelagius head out to the sparring area, where they chat for a moment before starting sparring at 6am. They will continue to do so all day long, finally stopping at 8pm, when he retires to his bedroll. If you observe them while sparring, your block and blade skills will increase. Fortis is one of the few Blades who wields an Akaviri dai-katana, the two handed version of the more common akaviri katana. He also wears a full set of Blades armor, which includes the boots, cuirass, gauntlets, greaves, and helmet. He sleeps in a brown shirt and light brown linens. His only other possession is a small amount of gold. "Please forgive me, but I'm afraid I haven't got time to talk right now. One of the other Blades should be able to assist you. Try Jena or Steffan." "Sorry, but I'm too busy to talk right now. Try one of the other Blades. Perhaps Roliand or Cyrus?" "I haven't time to talk right now, I'm afraid. But I'm sure one of the other Blades can help. Try speaking with Belisarius, or Caroline." This page was last modified on 20 October 2015, at 05:26.